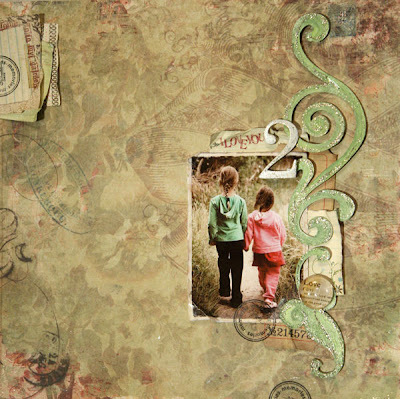 Gudruns papirblog: just a little vintage..
Made this little LO using one of my all time favourite pictures of my two little girls. And, as you know, I'm really into using up my old (and maybe forgotten) treasures. Found this DaisyD patternd paper. (oh, I miss this company! They were really one of my faves) Also used some chipboard-treasures. Covered them with Shimmerz-paint and some glitterglue. Had totally fun making a li'l bit vintage. Used filters and frames from Vintage Photo-tool kit by Rhonna Farrer to make the photo look old. Also used some "seal it" stamps by my Stamp BOX. absolutely beautiful pg. and pic! Nydelig Lo Gudrun, du er fabelaktiv flink til å bruke akkurat passe med pynt. Klemz fra Ann-Margret. love finding some older items that I've forgotten about -- it's like getting new stuff again! lovely page! Ha en videre deilig helg! Love the delicate simplicity to go with your favourite photo!! It doesn't need anything more than just the love you have put into creating this!! Så fin! Verkligen ett vackert foto! Tänk vad mycket fint man kan hitta i sina glömda skattgömmor! This is GORGEOUS!!!! Love it!